Leading Manufacturer of Industrial Battery Charger, Traction Charger, Home Solar Charge Controller, Flexi Charger, E-Rickshaw Charger and Sick Cell Charger from Kolkata. Battery chargers play an important role in ensuring optimum life and performance of Industrial Storage Batteries. Chloride chargers have been performing this duty relentlessly at different power plants, sub-stations, steel plants, refineries & petro chemicals,cement plants, oil & gas pipelines, telephone exchanges and many other industries for over last three decades.The main function of Industrial Battery charger is to supply the continuous D.C load and charge the battery bank as per user's requirement. In case of failure of main A.C supply,the battery bank supplies the constant and emergency D.C load. 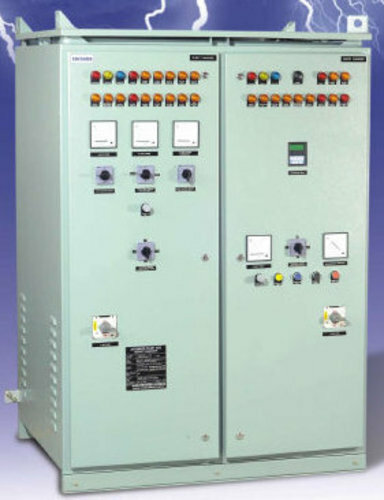 The AC to DC power conversion element of the system is typically configured from thyristor or switch mode technology depending on the application, criticality and space availability. The thyristor based systems are highly rugged and are suitable for the most demanding environmental and operating conditions. Chloride Home Charge is a compact and user friendly portable charger for inverter and automotive batteries. It is suitable for 12V system and operates on constant current constant voltage (CCCV) mode. Initially it charges the battery at constant current mode at 10A/9.4A. When the battery reaches 15V/16V, the charger automatically switches to constant voltage mode and continues the charging. It takes about 24 hours to recharge a completely discharged battery. This user friendly portable charger is equipped with a smart LCD display screen to indicate charging voltage, charging current, duration of charging and total Ah input.It also has some visual indications which enable the user to understand the functioning of the equipment. Home Charge is an excellent tool to revive deep discharged and even almost impossible-to-recover 12V flooded batteries used for inverter and automotive application. It is also ideal for charging 12V batteries which have got low open circuit voltage (OCV) due to deep discharge or remaining in idle condition for a prolonged period of time. Domestic inverter and automotive battery users and dealers can now breathe a big sigh of relief. Chloride Flexi Charger is a user friendly, light weight and portable equipment suitable for charging up to 4 sets 12V lead acid batteries simultaneously. This is a micro controller based SMPS charger and can charge from 1 to 4 sets of 12V lead acid battery. The user can connect any number of 12V battery (up to 4) and the charger fixes its charging voltage automatically through an intelligent selection procedure in-built in to the charger.Thus no manual selection is needed for the number of batteries connected with the charger. These chargers are ideal for charging automotive and inverter batteries at service stations and dealers’ premises. Chloride make E-Rickshaw charger comes in both Transformer based and SMPS based versions.It ensures easy, fast and optimum charging of the e-rickshaw battery within minimal time.Proper charging enable the user to get longer back up from the e-rickshaw battery and also enhances its useful service life. Taper charging profile of the charger coupled with in-built timers eliminates any possibility of overcharging.While transformer based model is best suited for abusive environment (poor quality of input power, high ambient temperature etc. ), the SMPS model is light weight and compact. The Sick Cell Charger is basically a SMPS based equipment.This charger is used for servicing of 2V VRLA / Non - VRLA cells in a battery bank.It can charge 2 to 3 nos 2V cells and therefore can be used for reviving any weak cell in a large battery bank. It also has facilities to charge cells on-line without disconnecting the weak cell from the battery bank. The number of cell selection is automatic. EBOPS or Emergency Board Operated Power Supply is an emergency service equipment mainly used in elevators. All the emergency services in the elevator (i.e. intercom,lights,fan,emergency alarm etc.) are connected to it. In case of normal AC supply all the emergency services of elevator connected to EBOPS operate from AC mains and the battery connected to it gets charged.If the AC mains power supply fails then EBOPS instantly switches to its battery operated backup power mode and powers all the equipment connected to it till the main power is restored or the battery gets fully exhausted. Chloride offers an EBOPS that has a pure sine wave output. It also has a safe maintenance mode which makes the equipment available for maintenance.In this mode it transfers the entire connected load directly to mains powers/ supply by-passing the equipment.It is suitable for both Valve Regulated Lead Acid Battery (VRLA) and non-VRLA Batteries. Smart Charge is the latest Charger from Chloride that is easy to install, commission and service.It is flexible and has two dedicated converters that can operate in both auto and manual mode.The control operation is done by Automatic Voltage/Current Control Module which programs a logic using micro-controller.Smart Charge is equipped with output Voltmeter and Ammeter.As an option,LCD display can also be fitted in place of meters.